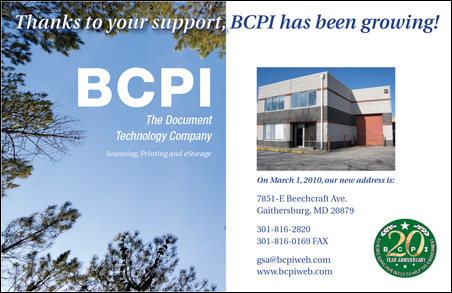 BCPI has moved to new, larger facilities in Gaithersburg Maryland. We've grown and expanded to meet the increasing need for our document management skills and services. BCPI receives the Award of "Best of Rockville" for Lithographic Form printing from the US Commerce Association. BCPI presents a new web site design with added features and information. The BCPI FCC EARLY BIRD EX PARTE service launches here. BCPI expands it's FCC document services here. BCPI has a special page which discusses our Schedule 36 and GSA Stars GWAC capabilities here. Read About the individual GSA SIN categories here. BCPI has a four-part animated presentation about our printing capabilities here. BCPI expands it's printing and online capabilities. BCPI has launched a new online registration system for access todaily digest Ex Parte FCC documents, along with new FCC pages describing BCPI services here. BCPI has added Audio/Video duplicating services to our official FCC services list. See our page here to learn about our FCC services. BCPI is now the official FCC copying & duplicating contractor. Our office at the FCC building in Washington D.C. is equipped and ready to handle all of your FCC document needs. See our page here to learn about our FCC services. and meeting offices in Rockville soon. BCPI has scanned and converted into digital format over a million documents for the U.S Government for paperless work flow solutions.